Ms.Margaret Ethel Geduhn, passed awayat the Coronation Hospital on Thursday, March 14, 2019 at the age of 84 years. 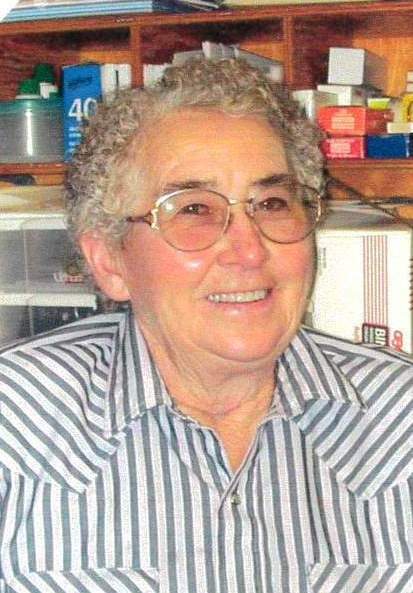 Margaret was born October 13, 1934 in Hemaruka, Alberta, the oldest daughter of George Frank Geduhn and Dorothy Ann Wroe – Geduhn. At the age of six years old, she moved away from Hermaruka, Alberta with her family to various locations throughout Alberta.In 1954, at the age of twenty, Margaret returned to the Wroe Ranch near Hemaruka, Alberta for a short visit with her Granddad Wroe and Uncle Albert. She enjoyed the farm so much that her short visit lasted sixty-five years. Margaret began ranching with her Uncle Albert, and then Renie joined them in 1962. Margaret’s brother, Frank joined in 1959, where he settled down on his own farm three miles away. When Uncle Albert passed away in 1976, Margaret and Renie took over the Wroe Family Farm, where she resided until her passing. Margaret loved the farm, from seeding grain to pulling calves, building things and her weekly trips to the Veteran Auction Mart; and to Renie’s dismaywatching Judge Judy in her spare time! In 2010, Margaret and Renie received the 100 Year Plaques for having the homestead in the family for 100 years. They received one plaque from the Province of Alberta, as well as a plaque from the Special Areas. Margaret’s sister,Charlote and brother-in-law, Robert and family, always made time to come for a visit on the farm. Margaret will be lovingly remembered by her sister,Charlote (Robert) Holt and their children, Stan (Debbie) Holt and their children, Brandan (Caitlin) Holt, and Jessica (Adam) Holt and great grandnephew, Grayson Way; Marie Holt and her children, James Holt and Savanna Holt; Rob Holt and his children, Bobbie (Samantha) Holt and Christina Holt; Kelly Semple; Arlene (Dave) Harris and their children, Danielle Harris and Brianne Harris. Margaret will also be sadly missed by her brother, Frank (Susan) Geduhn and their children, Heather (Mike Grady) Geduhn and her child, Melissa Geduhn; Karen (Tim) Dobruk and their children, Rebecca (Alex) Schneider and Samantha Dobruk; Kim(Ed) Cooper and their children, Ashley Cooper (Jonathan Caseley) and Ryley Cooper. Margaret will also be deeply missed by her sister, Irene ‘Renie’ Helen Geduhn. Margaret was predeceased by her parents, George and Dorothy Geduhn;her much loved uncle, AlbertWroe, a brother, Frederick Stanley Geduhn and a nephew, Stewart Holt. A Celebration of Margaret’s Life will be held at the Veteran Full Gospel Church, 100 Waterloo Street, Veteran, Alberta on Thursday, March 28, 2019 at 1:00 p.m. If desired, Memorial Donations in Margaret’s honor may be made directly to the Veteran Volunteer Fire Department, or to Stars Air Ambulance at www.stars.ca. Condolences may be sent or viewed at www.coronationfuneralhome.com. Arrangements in care of Coronation Funeral Home, 5117Victoria Avenue, Coronation. 403.578.2928.